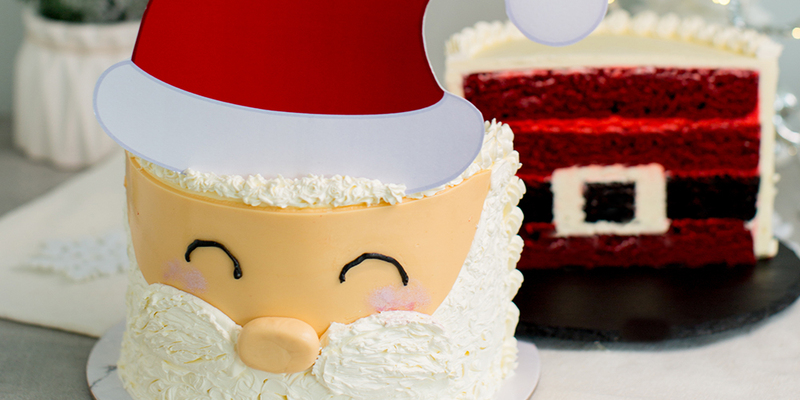 This cute Santa Cake comes with a surprise inside and we promise that it will be a showstopping centrepiece for your Christmas dinner celebration. This cake is made up of 3 layers of moist Red Velvet cake and 1 layer of Black Velvet cake. In this class, we will be teaching you the technique on how to achieve the santa belt effect upon slicing the cake. The cake is also filled and enveloped with a delicious Cream Cheese Swiss Meringue Buttercream. Students will get to work with some gumpaste elements and buttercream to create the features of Santa himself. Lastly a Santa hat topper will be provided to complete the final look! Come join us for this exciting class this Christmas!